Our patients benefit so much from their therapeutic laser treatments. We provide a quiet and comfortable room so that your pet can relax and receive his/her treatment to relieve pain and inflammation. The K Laser has proven to be remarkable. Our patients benefit everyday from this technology. 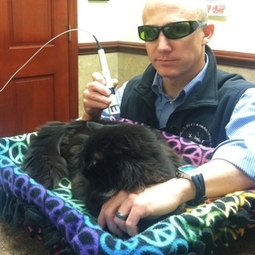 If your pet suffers from arthritis or other type of chronic pain, consider K Laser therapy to provide pain relief. It is amazing and affordable.